I have been relatively silent on my blog in the past month because my camera died and because I’ve been wrapped up in the procedure of moving where I was living temporarily in Whistler, BC down to a permanent home in Vancouver. I am still in transition as I write this from my friend’s computer in San Francisco, where I’m visiting while my husband packs up his things that we’re moving up to Canada. All this chaos doesn’t mean that I haven’t been creating, however!! I’ve got even more things on the go now than ever. Literally as we were moving, and on the road, I was unravelling this lusciously soft and furry sweater, and dyeing it was the first project I did in my new apartment. This soft puffy cap is the result. It is knit on the round in diagonal brioche stitch, I’ll post the ‘pattern’ later. With the yarn dyeing I was going for a much more even turquoise or aqua, but because there was so much yarn in the pot, and I added more dye as the bath progressed, it turned out quite variegated, which disappointed me. 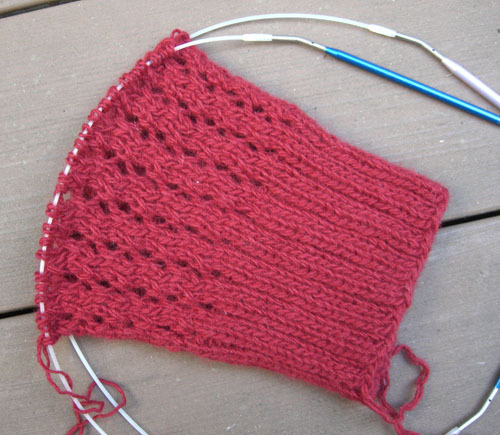 Knitting up in this kind of stitch, however, helps to even out the color, and avoid the obvious pooling that happens with stockinette stitch and space dyed yarns. 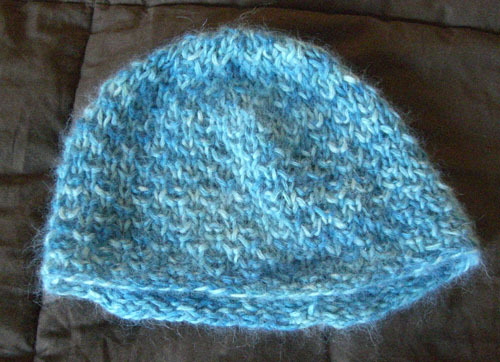 I have a bunch more of the same – this cap only used part of one of the 5 or 6 skeins I’ve got. So I’m considering overdyeing some of it, and I may make some more of these caps as gifts, because it was an ultra-fast knit. Now, on vacation, I’ve got various unfinished projects with me, and to add to that I’ve started another – a lace shrug, which I’m hoping to finish in time to wear it to a wedding this coming Saturday. Good luck…. I also have to finish sewing the skirt and top that I am planning to wear, and buy a pair of shoes!! I definitely go overboard… from time to time! Whatever comes together I will post after the event, but this is the beginning of the shrug, which is made of a recycled rayon/angora blend yarn held doubled. Your recycling and dyeing projects always look so lovely!